Gadaladeniya Temple, which is situated at Pilimatalawa on the Kandy-Colombo Road, just passing Kadugannawa, is famous for its beautiful stone carvings. This temple was built on a flat rock at Diggala in the 14th Century. Faded paintings from around that time provide many clues as to the manner in which the temple was built. The art is South Indian, so the general belief is that the workers were also brought down from abroad. The chief architect of this temple had been a South Indian called Ganesvarachari. Therefore, this temple is essentially a South Indian design. The genius of the Kandyan master craftsmen is very obvious in this region; whereby Gadaladeniya Viharaya is built of stone, the nearby Lankatilaka Viharaya and its Devale are built of clay bricks with a unique architectural design; Embekke Devale is built of wood while the mysterious Galengolla Potgul Viharaya with its valuable ola leaf manuscripts has a cover-up in the style of Florentine rebirth and its interior resembles a Christian basilica with cupola (dome) and octagonal pillars. The Gadaladeniya Temple also contains a beautifully painted giant wooden chest holding paintings and sculptures of great historical and artistic importance. 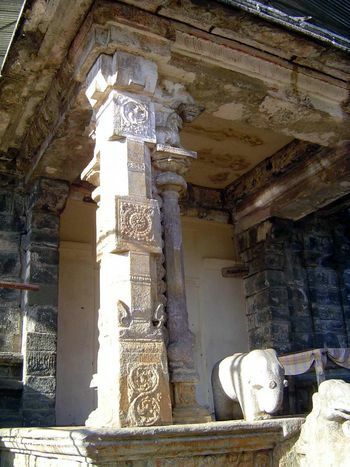 The entrance to Gadaladeniya features large stone pillars, which support a roof of huge stone slabs. Within the vihara, an ancient stone and plaster Buddha image looks down upon milkrice pots that have been collecting food offerings for centuries. The 638-year-old jak-wood doors still exhibit their original paintings. According to an inscription there, this temple was built by King Buwanekabahu IV in the year 1344. The main shrine room has a seated (in Vajrasana ) Buddha statue under a Makara Thorana and four standing Buddha images. The Makara Thorana is decorated on both faces with gods such as Brahma, Suyama, Santhusuta, Natha and Maithree, and two attendants. The chamber within the Sikhara (dome) has had a Buddha image, which had been destroyed by the Portuguese. Next to the shrine room is a Devale dedicated to God Vishnu. According to the Mahavansa, the great chronicle of Sri Lanka, it was 'Upulvan Deiyo' (Vishnu) that was selected as the guardian to protect the land of Sri Lanka and Buddhism within it at the time of Buddha's passing away. Therefore, this deity holds a special place among Sri Lankans. By the side of the Vishnu Devale is a stupa made on a rock. This is believed to have been constructed by King Parakramabahu V. This stupa has a roof built over it, held by four pillars. Four smaller satellite stupas are built on small shrine rooms around the main stupa. This structure is called the Vijayothpaya or Vijayantha Prasada after the mythical palace of god Indra. This temple had been neglected for some time and then had been handed over to Velivita Saranankara Thera by King Viraparakrama Narendrasinha (1707 - 1739); it had been looked after ever since by his pupils in succession. Though this temple is known as Gadaladeniya today, an inscription identifies it as 'Dharma Kirthi Viharaya', which is the name of the founding monk. 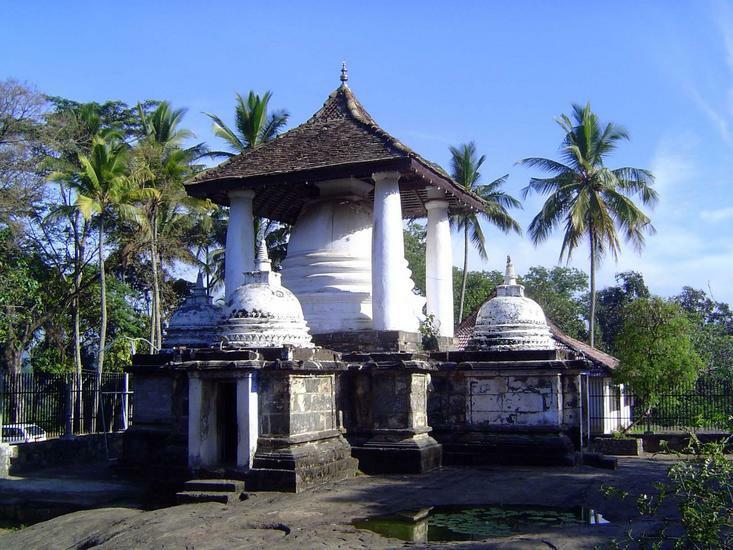 'Nikaya Sangrahaya' identifies this temple as 'Saddharmathilake' and 'Saddharmalankaraya' identifies this as 'Gadaladeniya Viharaya' after the village in which it is located. Gadaladeniya is one of the best places to view the original stone carving designs; there are many carvings on the pillars. So, next time you visit Kandy, don't just return after visiting the Dalada Maligawa, visit Gadaladeniya too. You'll be amazed by the beauty of this temple.